There is no debating the need for fans. They circulate air in your house, help you reduce your energy bills, and they even create soothing white noise that many people can’t sleep without. The question is not if your home needs fans, but what kind to get. There is a wide variety of options out there which is great, but it also makes it hard to determine which option is right for you. We are here to help you with that. Read on for our how-to guide for choosing a fan for your home! 2 What to Look for when Buying a Fan? Let’s now take a look at the many types of fans out there. Of course, we are all familiar with the ceiling fan. Since this unit is very literally attached to your home, not only is it designed to keep you cool but it can also be a stylish décor piece as well. Ceiling fans are by far the most powerful option that you are going to encounter and because of that power and their centralized location, they are also the best at circulating air throughout the room. This increased circulation can be a pretty big deal during the warm months of summer. 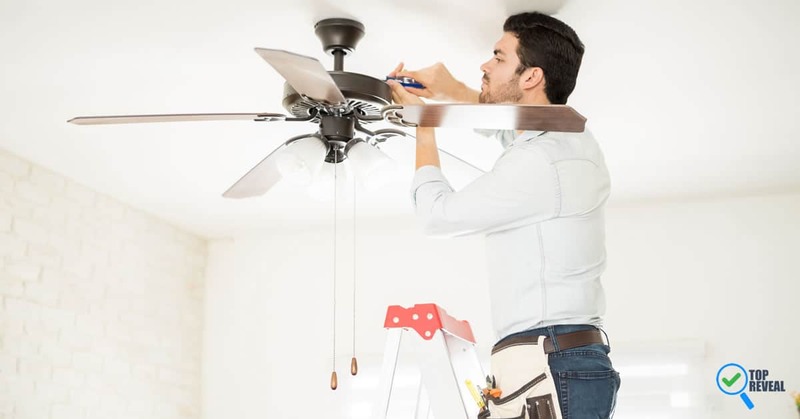 Running your ceiling fans while you have the AC on is going to put less strain on your unit (as it won’t have to kick in as often as it otherwise would have) and it will also help you to cut back on your energy bill. Of course, there are downsides. Given the nature of the ceiling fan, it is by far the most expensive option out there. Installation alone is generally a few hundred dollars, and then you also have to budget for the cost of the fan itself. Still, if you aren’t extremely worried about the financial side of the equation, the ceiling fan is a really excellent option. The floor fan is not nearly as powerful as the ceiling fan but it has plenty of other features that more than jus make up for it. The first thing that you are probably going to notice about floor fans is that they are very affordable. There are plenty that you can get for under $20, but even if you want to go high-end you can still expect to pay significantly less than you would have for the ceiling model. They also have the benefit of being portable. You can take them from room to room, or even travel with them if you feel so inclined. One shall consider getting a standing fan too. Drawbacks with this style of fan are pretty minimal, really. They won’t circulate air quite the same way that ceiling fans do, but they still enjoy the benefit of keeping you cool at a very affordable price. The window fan has the benefit of being able to either draw fresh air from outside into your home or filter out stale air. They are easy to install (generally requiring no tools) and they are also on the affordable side, generally priced similarly to floor fans. As is the case with the previous models we explored, proper use of these fans should save you a little bit on your power bill each month. The only downside here is that, like the floor fan, you aren’t getting the same power that you would enjoy from a ceiling unit. What to Look for when Buying a Fan? Here are a few things to look for when buying a fan. Size isn’t going to matter quite as much for the ceiling fan as it will for your other options (since generally most ceiling fans are the same size) but for everything else, it can make a big difference. With the window fan, you, of course, want something that can accommodate the dimensions of your window, but with the floor fan, you have a lot more wiggle room. Ideally, you are going to find an option that is big enough to provide coverage of your room but small enough to be moved easily around the house. There is no ideal noise level when it comes to a fan. Some people prefer silent models, while others use a fan because they make noise. Whichever option you prefer, you are of course going to want to make sure that the fan you buy is able to provide it. You can get a rough idea of how noisy a fan is by hearing what people say about it online. Otherwise, some stores will have demo models that will of course let you know exactly what you are dealing with. Most fans are adjustable, but the number of settings they have can vary from model to model. The more settings available, the more options you will ultimately have, so pay attention! A powerful fan will keep your room nice and cool but be careful! There is also such thing as too much power. Again, customer insights and floor model demos will be a great way to determine what you are dealing with. Of course, the price is always going to be a factor. If you don’t want to spend a lot you are going to be better off with a floor fan. If you don’t mind spending a little more money, the ceiling fan could be the way to go. Smaller rooms are going to do fine with a window or floor fans. Larger rooms, on the other hand, will benefit either from one ceiling fan, or several floor fans. Features like a timer, a remote, or a rotation component are great, but they can also amp up the cost. Consider both what features you would like to have and how much you are willing to pay before you make your decision. As you can see, there is plenty to think about as you set out to purchase a fan. Cost, appearance, portability, and efficiency can vary pretty dramatically depending on what type of unit you decide to go with. For that reason, it is very important that you enter the process prepared. The good news is that you now have all the information you need to make an informed buying decision. All that you have to do now is pick the type of fan that most suits your needs and enjoy a cooler home and lower power bills! Why Keeping Your Home Clean is an Utmost Necessity?